BlackBerry Curve 8530 coming to Sprint | BlackBerry Blast! Sprint has made it official. 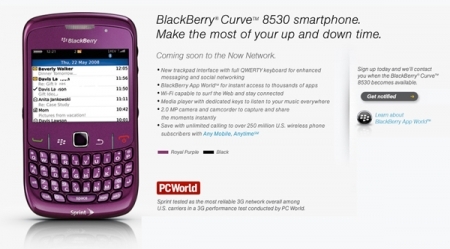 The BlackBerry Curve 8530 is on its way. The company has not released pricing or release date details yet, but we're assuming this low end BlackBerry will be in stores soon. The BB 8520 is already on T-Mobile, and Verizon is set to launch a similar Curve on November 20. Look for Sprint's version to be around $100 with contracts and rebates.